Ever since Mei Jing came to Monifa's school they've been best friends. They're both artistic and like to create wild designs together. They love to play at each other's houses; at Monifa's, they make a tent out of her mother's African blanket, and at Mei Jing's, they play with her new puppy and dream of having a veterinary clinic when they grow up. On one visit to Mei Jing's, Monifa notices that Mei Jing's grandma spends a lot of time there. She speaks Chinese and calls her granddaughter Mui Mui. Mei Jing's father even shows Monifa how to use chopsticks and Monifa tries food she's never eaten before. Luckily they don't serve chicken's feet! At Chinese New Year the girls learn the Dragon Dance, and when Mei Jing's parents give Monifa a red envelope, she's surprised to discover it has real money in it! 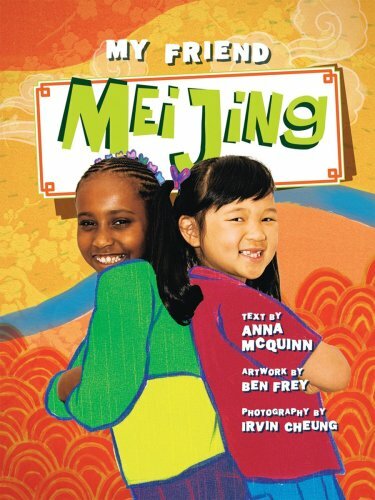 The second in the My Friend series, My Friend Mei Jing is a poignant story that demonstrates how friendship is the strongest bond among kids living in a diverse community. About Ben Frey (Illustrator) : Ben Frey is a published illustrator of children's books. Published credits of Ben Frey include My Friend Jamal (My Friend). About Irvin Cheung (Photographer) : Irvin Cheung is a published photographer of children's books. Published credits of Irvin Cheung include My Friend Mei Jing.